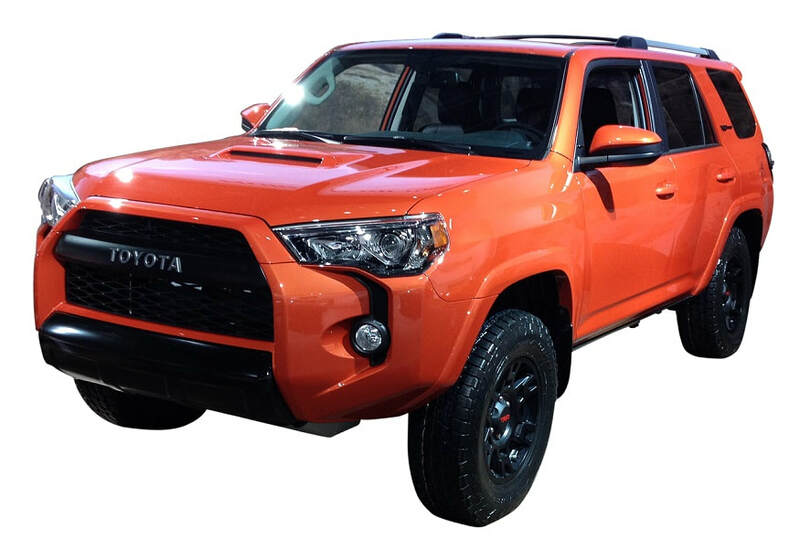 Toyota Factory Warranty includes 3 years or 36,000 miles of no cost repairs for all components, (5 years or 60,000 miles for the engine), and 2 years or 25,000 miles of no cost maintenance. ​The ToyotaCare scheduled maintenance includes oil changes, tire rotations, fluid top offs, multi-point inspections, and complimentary roadside assistance. The inspections are more important than often considered because malfunctions can be detected and repaired while the vehicle is still within the full Toyota factory warranty. For owners who plan to keep vehicles longer, Toyota offers three options of Extra Care to offset the cost of breakdowns beyond the basic warranty. What are the Toyota Factory Warranty Options? The Toyota Platinum Warranty is the highest level of electrical, mechanical breakdown protection offered by Toyota. The plan pays parts and labor for repairs on the engine, transmission, computer, air conditioning, radiator, fuel system, steering, suspension, electrical, and all other parts not on the exclusion list. The Gold plan has an extensive list of covered components but does not cover items beyond the list like the Platinum plan does. This may be a suitable choice for a base model Corolla but a fully equipped Sienna will eventually need repairs not covered by this option. For a list of covered parts see PDF section below. This minimal plan covers the main parts that make the car move: engine, transmission, and axle assembly. Owners choosing this option will eventually have out-of-pocket repairs but at least the most expensive malfunctions are covered. How much is the repair copay? Toyota has the industry’s lowest deductible copay options: $0, or $100 disappearing deductible — which disappears when the owner returns to the selling dealer, and only applies when repairs are done at other locations. The $100 deductible seems like a good choice but it only costs $250 more upfront to buy the $0 plan. Therefore, F&I Tools analysts consider the $0 deductible Toyota Platinum Warranty the best bang for the buck! 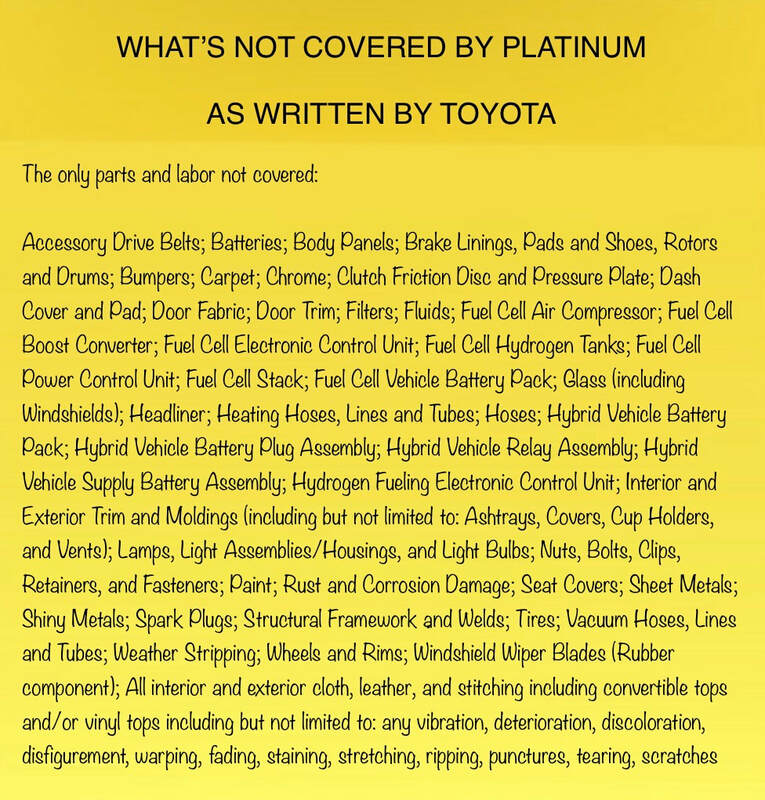 How much does the Toyota Platinum Warranty cost? Price may vary by model, usage, location, and odometer reading at time of sale. Where will repairs be done?